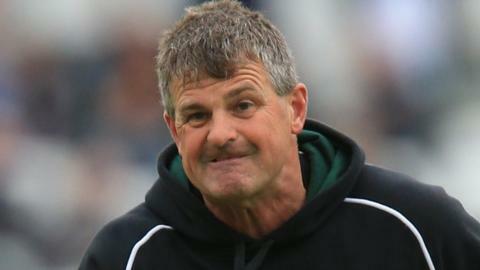 Worcestershire coach Steve Rhodes is hoping for more luck with the toss as his Division Two table-toppers bid to secure promotion over the final two games of the Championship season. Successive defeats have left them just seven points clear of Hampshire. They play third-placed Surrey at home next week, before travelling to face fourth-placed Essex a fortnight later. "Winning the toss in one, if not both, of these last two games will be crucial," Rhodes told BBC Sport. "Sadly for us, we've lost the toss twice in a row." Wednesday's 138-run loss to Derbyshire followed their first Championship defeat of the season by Gloucestershire at New Road a fortnight before. "It was very difficult at home to Gloucestershire to try and get some runs on that first day and the toss proved quite crucial," said Rhodes. "I didn't think it would be as crucial a toss against Derbyshire, but they got things right. They got a score on the board, the wicket wore and the footholes were quite big and deep - and it certainly kicked for the spinners. They got their selection right." Thanks to the match-winning efforts of star Pakistani spinner Saeed Ajmal earlier in the summer, Worcestershire - who are 39 points better off than Surrey - still should have enough in hand to secure a fifth promotion in 11 years. But Surrey will come to New Road next week with their three ex-Worcestershire players Vikram Solanki, Gareth Batty and Steven Davies all keen to crank up the pressure. If they fail to beat Surrey, fourth-placed Essex, although 51 points off top spot, could be be brought into the equation as they host Kent next week, then visit bottom club Leicestershire before meeting Worcestershire in the final game at Chelmsford. Asked if the pressure of getting over the finish line having been out in front for so long was affecting players, Rhodes said: "One of the things we are trying to do is make sure the players stay in the present. "We must just concentrate on getting into a good position and then putting our foot down. "Ultimately we will rue some slip-ups in the field against Derbyshire. Some chances that went down - and also not putting a stamp on things in our second innings. "We have to make sure in crucial moments that we do things right. It does come and go, the catching, but it was disappointing to drop a few."